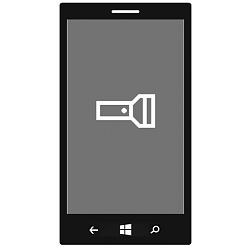 Windows 10 Mobile Insider Preview Build 10149 for phones now includes a Flashlight quick action button in the Action Center so you can quickly turn your phone’s flash into a flashlight. This tutorial will show you how to quickly turn on or off the flashlight as needed on your Windows 10 Mobile phone. 1. Swipe all the way down from the top of your phone to open Action Center.